Hello and welcome to the 56th installment of the SWD. 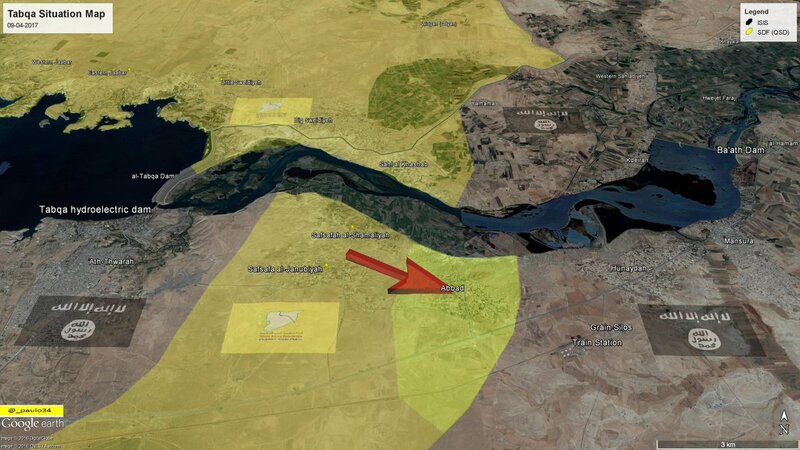 SDF advanced east of Tabqa city today and captured Abbad village from IS, after this advance Safsafah area is secured from IS attacks and buffer zone is increased around besieged Tabqa city and dam. During clashes for Abbad village 30 IS fighters were reportedly killed. Clashes erupted between SDF and IS southwest of Tabqa city as the former is advancing in the area between the city and airport. Rebels repelled SAA & allies attack towards Halfaya and Jaysh al-Izzah released a statement saying they destroyed a tank with TOW on Tall Sofouh south of Halfaya. General situation in northern Hama, keep in mind that rebels control Maardes even though it is shown as SAA-controlled on the map. Source: Interactive Rurikmap which can be found here. In southeastern part of Homs governorate IS launched a surprising attack against FSA and Iraqi Army located in Al-Tanf and Al-Waleed border crossings area, respectively. Attack came from two directions, from Abu Kamal on Syrian side and from desertous area around Al-Rutbah on Iraqi side. IS used three SVBIEDs in the attack and one reportedly exploded at a base belonging to FSA-linked Jaysh Usud al-Sharqiya in Al-Mufaraq killing three civilians. Following this attack reports surfaced stating that US Army’s convoy entered southern Syria from Jordan. Attack by IS was repelled but location and intentions of US convoy in Syria are still unknown. 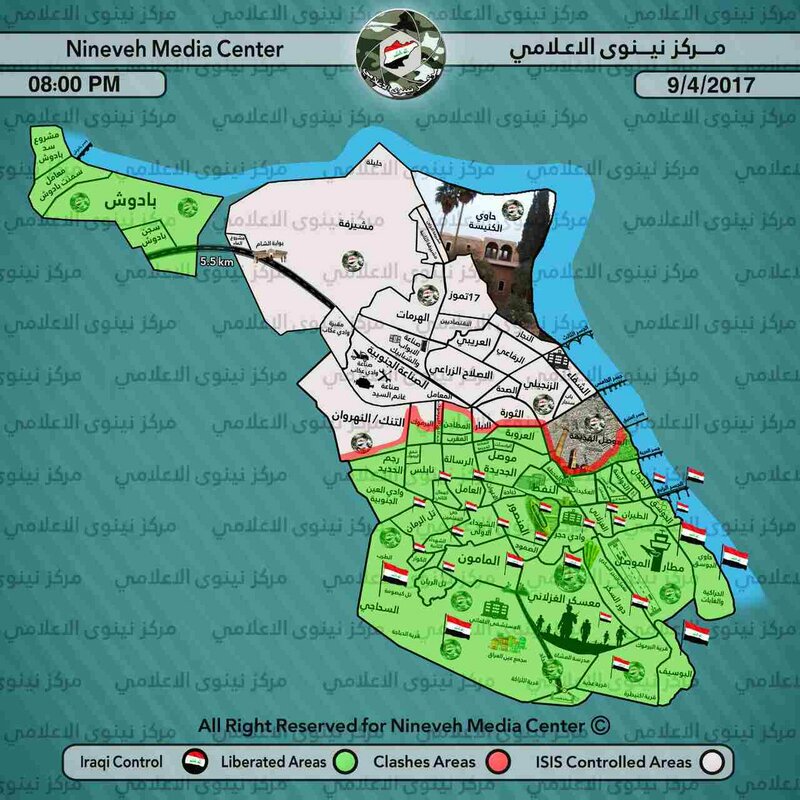 Iraq Joint Operations officially announced Al-Matahan district in west Mosul fully liberated from IS by Iraqi Army. In 17 Tammuz district. northern part of west Mosul Iraqi Army killed six IS officials by shelling, Hassan Zaydan IS intelligence chief, Harith Abd al-Allah Suleiman (Abu Osama) IS commander that used to be an officer in Saddam Hussien’s army, Majid Mahjoob (Abu Anfal) commander of Asrah army, Abu Faris from Saudi Arabia security chief for west Mosul, Abu Haroon al-Masri from Egypt IS governor of 17 Tammuz district and Abu Anas al-Hijazi from Saudi Arabia official for Nineveh governorate. Islamic State’s Shura council reportedly chose Abu Bakr al-Baghdadi’s successor, Abu Hafsah al-Mosuli IS deputy governor of Nineveh is expected to take leadership in case of Baghdadi’s death. This decision caused unrest among IS and infighting was reported. Abu Bakr al-Baghdadi is allegedly taking shelter in IS stronghold of Baaj, Nineveh governorate. IS committed more massacres against Iraqi civilians trapped in west Mosul, in Al-Zanjili district north of Old Mosul district a pregnant woman and her husband tried fleeing towards Al-Thawrah district and then perhaps to Iraqi Army’s positions in Al-Arubah district south of Al-Thawrah. However, couple was caught by IS when they tried to flee Al-Thawrah and were executed. In Mushrifah district a group of civilians estimated to be around 60 tried to flee north towards Hlaylah perhaps in an attempt to reach east Mosul via boats, however, they too were caught by IS while trying to flee. They were all reportedly executed by IS for trying to leave “the land of Islam” towards “unbelievers”. Iraqi Army launched a counterinsurgency operation against IS cells in Al-Tarmiyah, Salah al-Deen governorate. Al-Qaeda in Iraq controlled area from 2006 till 2008 but extremist sleeper cells remain in Al-Tarmiyah till this day. Kurdistan Democratic Party and Patriotic Union of Kurdistan had meetings with several foreign diplomats where they discussed upcoming referendum on Kurdistan Regional Government’s independence from Iraq. They agreed that referendum will take place in all areas under KRG control including Kirkuk which would mean violation of the legal territory agreed in Iraqi constitution. Kirkuk is rich in oil and natural gas meaning that both KRG and Iraq would like to have it under their control. On the 8th of April 2017 CJTF-OIR has conducted seven strikes in Syria. CJTF-OIR‘s main focus in Syria at the moment is Tabqa-Raqqa region where they did seven strikes supporting SDF‘s operation against IS destroying four vehicles, three fighting positions and two tactical vehicles; and suppressed nine IS tactical units.